The San Joachin kit fox inhabits the chaparral, grasslands, and scrublands of the San Joaquin Valley of California, USA. Kit foxes live in dens. They also live in man made structures such as irrigation pipes, drainage culverts, spaces under buildings and storm drains. Kit foxes have large ears set close together, a slender body, long legs, and a black-tipped bushy tail, which sticks straight out behind them. The pads of their paws are hairy which gives them better traction in the sandy soil of their habitat. Their underparts are light colored and their upper parts are pale grey in the winter and tan in the summer. Their ears are dark colored on the back side. cm (9-12 in.) at the shoulder and averages about 51 cm (20 in.) in body length. Its tail adds another 30 cm (12 in.). Fully grown, the kit fox weighs about 2.3 kg. (5 lbs.). The San Joachin kit fox is a nocturnal animal, but can sometimes be seen during the day in spring and early summer. A pair of San Joachin kit foxes stay together year round, but may not share a den. They can have as many as 24 different dens. They reach sexual maturity at 22 months and mate from December to March. The female is pregnant for 48 to 52 days. There can be 3-5 pups born at a time in a litter. They dig special pupping dens with several rooms. While the female is nursing the pups, the male hunts for both of them. After 1 month the pups are weaned and leave the den. After 4-5 months the pups can find their own food and leave the family. Sometimes female pups will stay longer and leave the mother after a year. Kit foxes are known to live for 7 years in the wild and can live as long as 10 years in captivity. They are solitary animals, preferring to live alone or in a small family group rather than in packs. San Joachin kit foxes eat ground squirrels, gophers, birds, and lizards and nocturnal rodents. They also eat kangaroo rats, mice, black-tailed hares, antelope squirrels, cottontails, ground nesting birds, insects, vegetation, and grasses. As they eat both animals and vegetation, they are omnivores. 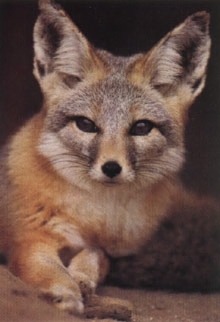 The San Joachin kit fox's predators are coyotes and red foxes. Man is also a predator because he sometimes shoots or poisons the San Joachim kit fox. The San Joaquin kit fox is able to adapt to hot temperatures of the chaparral summers and cold temperatures of the winter nights. They are nocturnal and so are active during the cooler time of night. Another adaptation for the heat of the desert is the size of their ears. The ears of the kit fox are big and they act like radiators, cooling the fox. Digging dens is another way they adapt to coping with the heat of the desert. The den is cool under the tree roots and out of the heat. The kit fox's fur changes color from grey in the winter to tan in the summer to camouflage it. Another adaptation is the fur/hair on the pads of their paws, which gives them better traction and protects the paws from the heat of the chaparral sand. 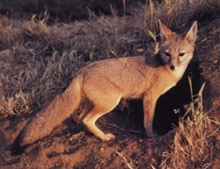 The kit fox is threatened by the red fox and the coyote, who are predators. The kit fox is also threatened by man through hunting, electrocution, traffic, trapping and poisoning. The farmer might do this because the kit fox is bothering his chickens and other farm animals. Much of the San Joaquin Valley has been turned into farmland and developments. Grazing animals have destroyed the chaparral that protected the kit fox's prey. The Fish and Wildlife Service of California has put the San Joachim kit fox on the threatened wildlife list.